Santa Maria degli Angeli in Florence, a monastery of the Camaldolese order, was the home of a number of scribes, painters and illuminators in the fourteenth and fifteenth centuries. They worked both for their own house and for other churches and even secular customers. Silvestro dei Gherarducci (1339-99) was active as a painter and illuminator in the abbey from the 1370s, though he also acted as sub-prior and prior. He illuminated works not only for Santa Maria degli Angeli but also for a Camaldolese house in Venice, San Michele a Murano. At this time, Venice was not a centre of illumination. In 1401, Dominican nuns wanting advice on the making of books were told by Giovanni Dominici, a Dominican from Florence, to study the choirbooks of Santa Maria degli Angeli, which contained Silvestro’s work. Silvestro may have worked as part of a team with some ornamentation done by others. Illuminators such as Belbello of Pavia and Cristoforo Cortese were later employed on the choirbooks and it is through their careers in Venice that compositions and styles developed by Silvesto dei Gherarducci became used in that city. 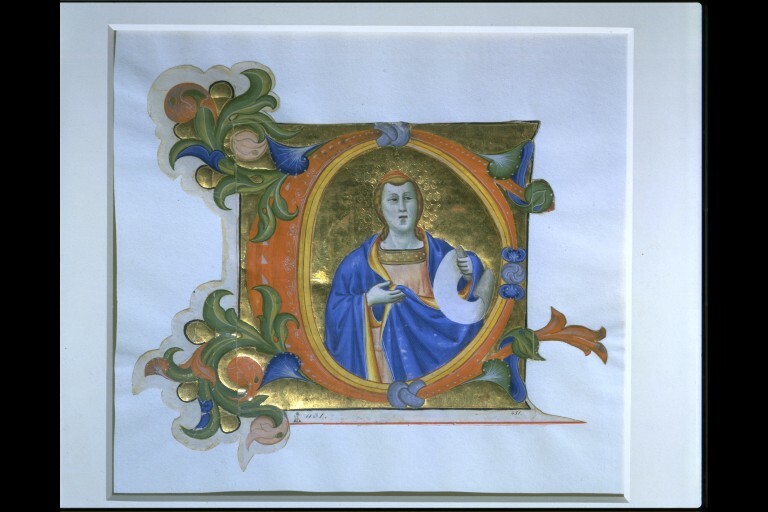 Cut-out historiated initial C, in orange, yellow, blue and burnished gold, taken from a Gradual. The initial has acanthus decoration stemming from it in blue, green, orange, pink and gold. Inside is a prophet holding a scroll, set against a gold background anddressed in a pink and gold tunic and a yellow lined blue cloak. The initial introduces a Communion hymn in the Mass for the third Sunday after Easter. 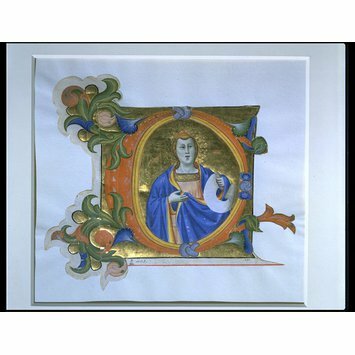 Historiated initial C from a Gradual, prophet with scroll, attributed to Don Silvestro dei Gherarducci, Florence (S. Maria degli Angeli), 1382-1399. 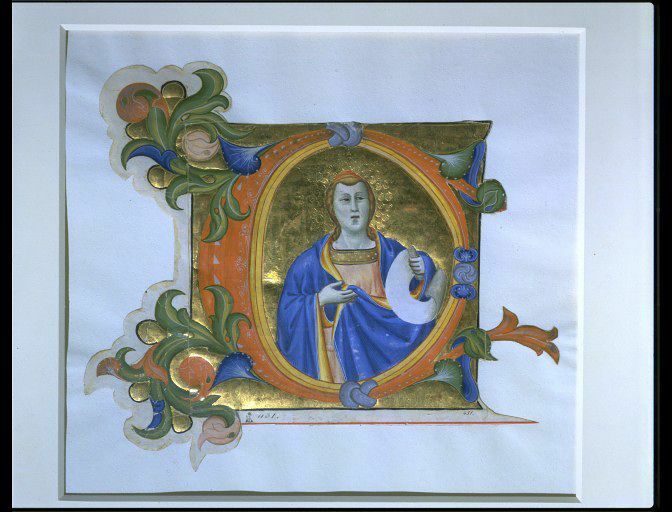 Cut-out historiated initial C (Prophet), from a 14th-century choirbook made for San Michele a Murano in Venice. Made for San Michele a Murano in Venice?? ?